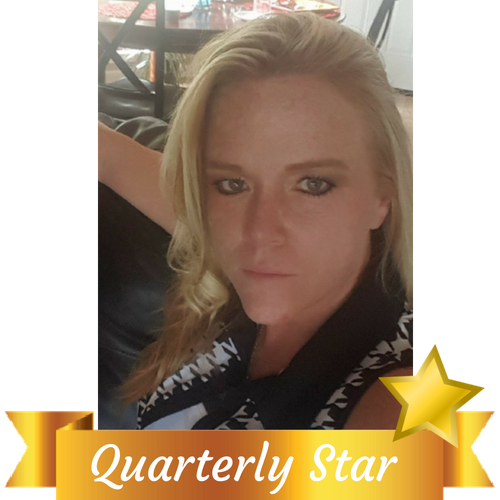 Maid in America is proud of our Quarterly Star ~ Stephanie! Stephanie is actually born and raised in Marietta where she lives with her husband of 18 years and three sons - ages 15, 16, and 18. She also has a 12 year old pit bull names Rex, a kitty named Ellie, 2 iguanas and 2 large red eared turtles. Wow! In addition to taking care of her family and pets, she loves fishing and riding four wheelers and motor cycles! Stephanie's lives by her motto - "Love the Lord, work hard, raise good kids and be the best person I can be." Stephanie take pride in cleaning her clients home the way she would like her own home to be clean. Stephanie is such a credit to Maid in America and her clients! No wonder she is so great to be around! Congratulations to Stephanie – our shining Quarterly Star!